“Hawaiians need to stop living in the past.” We’ve all heard this before, and we’re probably going to hear it a lot in the coming days. Brave people are getting arrested up on our sacred mountain right now in frigid temperatures (there was even a blizzard there a couple of weeks back), continuing a years-long fight and engaging in a blockade to prevent the further cultural and environmental desecration of the very piko, the umbilicus, the center of our islands by the Thirty Meter Telescope. I attended an overnight vigil a few nights ago on our island to show support for these koa on theirs, and we got an update via phone from Kahoʻokahi Kanuha and Lanakila Mangauil, two of the humble young leaders of the blockade. I stood at the edge of the torchlight and wept as they spoke, struck by how the depths of their aloha manifested in a fierce love not only for the ʻāina that they were protecting but for those who stood in opposition to them. It could not have been clearer from the words and the actions of the people up on the mauna and those standing in solidarity with them that they are concerned with nothing more than the very future of our world, our islands, and our people. Yet in boardrooms and newspapers, social media and overheard conversations, they have already been accused of “living in the past” or even of “wanting to keep Hawaiʻi in the Stone Age.” In fact, in an article on an earlier blockade to stop the Thirty Meter Telescope this past October, a science writer for the New York Times connected the action on the mauna with the repatriation of Native American burials from museums, and lumped them all together as an anti-science “turn back toward the dark ages.” Now, as much as I am devastated and inspired by what is going on up on the mountain one hundred and eighty-five miles away, this is not a post about Mauna a Wākea, because I am a malihini to that place and that issue, and can only say that I stand in support of our steadfast koa in those rocky heights. What this post is about is how any time Hawaiians—or any other native people, for that matter—come out in force to push for more respect for our culture and language or to protect our places from this kind of destruction, we are dismissed as relics of the past, unable to hack it in the modern world with our antiquated traditions and practices. Though the very things that people say they love most about Hawaiʻi are actually what Hawaiians and their allies have been trying to protect for decades, we are still considered nothing more than speedbumps slowing everyone down on the road to progress. We are even smugly condemned as hypocrites for daring to use smartphones and social media and cars or any kind of technology in our activism, because somehow asserting ourselves as modern, innovative, future-looking native peoples does not jibe with the image of living fossils that the rest of society seems to have of us. Yet remembering the past does not mean that we are wallowing in it. Paying attention to our history does not mean we are ostriching our heads in the sand, refusing to believe that the modern world is all around us. We native peoples carry our histories, memories, and stories in our skin, in our bones, in our health, in our children, in the movement of our hands, in our interactions with modernity, in the way we hold ourselves on the land and sea. Sometimes people see themselves implicated in the injustices and abuses we wear so clearly on our selves, and it makes them uncomfortable. They see a queen deposed and held prisoner in her own palace. They see children taken away from their tribes to abusive boarding schools, shorn of their hair, and made to refuse their native language. They see people and animals used as guinea pigs for nuclear experiments, the only outcry coming from those concerned about the animals. It makes them want to look away and ignore us. It makes them tell us to stop showing it to them. They are the ones who want us to only be living in the past, so that their pain can end. But we don’t carry only pain, we carry connection. Whenever we resist or insist in the face of the depredations of developers, corporate predators, government officials, university administrators, or even the general public, we are trying to protect our relationships to our ancestors, our language, our culture, and our ʻāina. But at the same time, we are trying to reawaken and protect their connections as well. That short-sighted model of “progress”—that we seem to be standing in the way of—hinges upon all of us, all of Hawaiʻi’s people, all of the Pacific’s people, all of the world’s people losing connection to land, to sea, to other human beings. The less you feel these connections, the easier it is for you to be convinced that unrestricted development is the highest and best use of land. That kind of progress means the University of Hawaiʻi and its international partners justify building on Mauna a Wākea by pointing to permits and documents that they have secured rather than any real sense of kuleana. That progress means farms exploit migrant labor and then label their products as organic and sustainable. That progress means Freeport McMoRan and Rio Tinto brag about the amazing knowledge it took to build the largest copper mine in the world in the mountains of West Papua but insist that they don’t know how to keep it from polluting the entire Aghawagon River ecosystem. That progress means our state tries to legislate homeless people out of existence because they are an eyesore for tourists but do nothing about the structural inequalities that force them to live on the sidewalks of Kakaʻako and in the bushes of Waiʻanae Boat Harbor. All of these things done in the name of rootless progress show (un)surprisingly little care for trying to truly progress and create a future that we all want for the coming generations. And when you see the possibility of “progress” in this more connected way, you see that we are actually the ones looking to the future. We are trying to get people back to the right timescale, so that they can understand how they are connected to what is to come. One of the urgencies for the construction company trying to break ground for the telescope on the mauna is that they have a limited time in which to execute the contract. But we are operating on geological and genealogical time. Protecting the ʻāina, carrying on our traditions, speaking our language, and acting as kahu for our sacred places are not things measured in days, or weeks, or even years. This work spans generations and eras and epochs. Our genealogies are a backbone stretching to the very inception of these islands, and when we understand our genealogy, we know our origins, where we have been. We always have our ancestors at our back. That certainty gives us a wider possibility of movement, a more supple way to navigate through the world. Standing on our mountain of connections, our foundation of history and stories and love, we can see both where the path behind us has come from and where the path ahead leads. This connection assures us that when we move forward, we can never be lost because we always know how to get back home. The future is a realm we have inhabited for thousands of years. You cannot do otherwise when you rely on the land and sea to survive. All of our gathering practices and agricultural techniques, the patterned mat of loʻi kalo, the breath passing in and out of the loko iʻa, the Kū and Hina of picking plants are predicated on looking ahead. This ensures that the land is productive into the future, that the sea will still be abundant into the future, and that our people will still thrive into the future. This is the future we are leading the way to, the future we are going to live in, the future our ancestors fought for, the future we still fight for. Note: A few people have mistakenly read this post as an explanation of why I am against the telescopes, which it is not. It takes my opposition to the telescopes as a jumping off point, but is not meant to serve as an explanation of it. 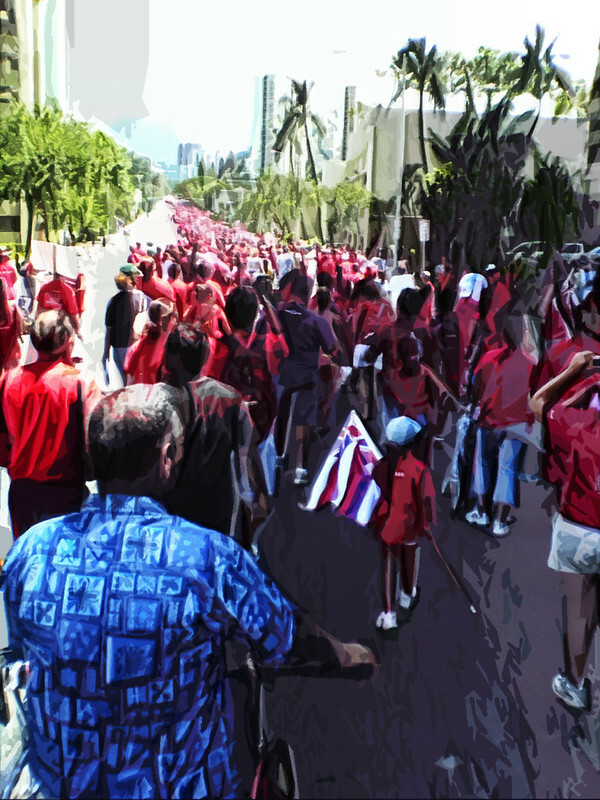 There are many places you can go to find cogent and thoughtful opposition to the telescopes, and these links relating to the struggle over Mauna Kea are just a few examples to give you a sense of what is going on. A recent BuzzFeed article is a good primer to some of the basics of the situation. This piece from Kāhea: The Hawaiian-Environmental Alliance outlines some of the legal protections afforded Mauna Kea, and this is a slightly dated but still relevant basic overview of the opposition to the telescopes. Also a Twitter discussion among astronomers. But please do some research on your own because there is a lot of complexity to this issue that isn’t really getting conveyed in most discussions. There is also some really inspiring activity going on about the mountain right now. Please sign this petition to halt the arrests and construction if you are so moved. Mahalo, Bryan for your words and connecting us to what truly matters. I’m inspired by your perspectives. You are calling us all forth to a future that is truly connected and worth living, worth fighting for. Mahalo iā ʻoe, e Mary ē! I’m just glad to be able to lend my voice to the chorus of calls for that future. Thank you so much for your comment and commitment. Bra, this is awesome. Mahalo for your perspective and response to anyone who might question why these sort of things like protecting Mauna Kea are so important. Mahalo nui hoʻi iā ʻoe, e Aoloa ē. Yeah, we have been hearing this kind of thing for so long that I was happy that I could speak back to it a little. Anyway, brah, thanks for reading! Good to see so much good attention coming to the mauna. I think the kapu aloha really has made a difference in the way everybody is approaching the situation. Still hard, but one awesome thing has been seeing everyone standing up together. Aloha nō. A mahalo nui iā ʻoe i ka heluhelu ʻana! I get nervous putting my writing out for people to read, and this is a much larger audience than the academic writing I normally do, so thank you. I appreciate the support! Excellent mana’o and so beautifully written! Eo! Eō! Mahalo for the kind words! I was pretty surprised at how many people were reading this, since we just started the blog last week, but thanks so much for reading and commenting. I really appreciate it. And I’m really heartened by how many people are coming out to everything, online and offline, to show their support. Oh, great article, Jacob! Thanks for including me! What has the response to your article been like? It can be so difficult to give language to an indigenous epistemology because what we know is WITHIN US, and as you so beautifully put it, “in our skin, in our bones, in our health, in our children, in the movement of our hands, in our interactions with modernity, in the way we hold ourselves on the land and sea”… so many people don’t understand this way of knowing, and therefore can’t see the value in it, so it is so beautiful and comforting to see and be able to share the words. Mālama pono, and mahalo nō! Mahalo nui, e Dawn ē! what about the other thirteen observatories atop Mauna Kea, why are they not actively protested. What makes this one worthy of protest but the others not? If you truly feel Mauna Kea as sacred ground then there should be 24x7x365 protest ongoing for the past 15+ years. Anything less comes across as hypocritical. Hahaha, dear Some One, thank you for your comment. I guess this is our first troll comment, as I’m assuming that your email someone@somewhere.org isn’t real. The anonymity afforded by the internet is so interesting in the way that it allows people to say things that they wouldn’t otherwise say in public without having to accept any of the consequences that come from their words. Anyway, I still think it’s worth posting and responding to because your question about the other observatories being protested is a common one. The fact of the matter is that formal protest has been happening since at least 1974, with opposition registered against each telescope. And, it turns out, the first two telescopes were built without permits, and permits had to be issued retroactively. As to your second point about being hypocritical, I urge you to do your own research instead of just weighing in on a complex topic that necessitates a nuanced understanding of the environmental, cultural, and historical contexts that surrounds this issue. Due to that lack of effort or knowledge on your part, I also reject the idea that you might have any standing to make *any* assertion about the character of the people involved in this struggle. Please feel free to comment again as a real person, and we can engage in discussion, after you’ve done your homework, that is. Aloha iā ʻoe pū. Mahalo ia ‘oe no keia mana’o! So profound and simple! Aloha nui, e Pauahi ē. Mahalo iā ʻoe i ka heluhelu ʻana! Thank you also for your words. We appreciate all the support! Very insightful, you express how many people feel in their na’au, but are not able to say out loud. Thank you for sharing your manao! I hope many people, both kanaka Maoli and kamaaina, are able to read this and use this tool to help educate others as you have clearly written here. Thank you for educating our world on the truth of our people’s protest to malama our island culture, beliefs, and Aloha Aina. Sustainability starts here with our island history and relationship with our ocean and aina. We will continue to thrive forward! Aloha nō e Cyndi ē! Yes, this is something that has come up in conversation with so many people, and we’ve all heard and felt the weight of that kind of dismissal. I am glad (and surprised) to see this post making the rounds and going as far as it has. It’s always inspiring to hear from committed people, so thank you very much. And mahalo hoʻi for adding your own manaʻo to this discussion! Aloha from Kaua’i Bryan. Beautifully spoken and necessary – thank you. We share your vision. Aloha nō from Oʻahu! Mahalo nui i ke aloha ʻana mai a me ka heluhelu hoʻi! Thank you so much for your kind words. I am grateful to have been able to express at least a little of that vision that so many of us share. Mauruuru Bryan for saying my thoughts out loud. I am from Tahiti, but I feel truly connected to the issues that have been given light as of late here in Hawai’i. I grew up with my grandparents who were farmers and lived intimately with their land, however they regarded French and English as the ‘educated’ languages and tattoos as blasphemous. This movement has awakened my beliefs that our culture and traditions are relevant in today’s global society, and I thank you for addressing the issues surrounding the entire Pacific for we all share this beautiful Ocean! Mahalo iā ʻoe, e Gloria ē! Yes, this issue has a really broad resonance with folks. And I’m glad to hear that other Pacific folks are reading this blog. We are Hawaiʻi-based, but everyone writing for us has connections to different areas. I definitely know what you mean about French and English as the ʻeducatedʻ languages. I think it’s changed a lot now, but when I was learning Hawaiian, there was still a pretty strong stigma attached to it. But anyway, please come visit our blog again, we have new posts every week, and we’d love to hear more from you! Aloha no……..Bryan, Mahalo nui for your beautiful, kind, thoughtful, well put together merely explanatory writing concerning “Us” hawaiian people, our culture, our belief, our history and our future endeavors. I have read this once, and yet to read it five more times at least, just to grasp every wonderful word, that made so much sense. I gather that you are a very kind, and well educated man who choose to enlighten all the “someone’s somewhere” around the world, and for the rest of us hawaiians who continue to give their 101% support, physically, mentally and spiritually. We thank you from the bottom of our hearts, your writing has encourage and inspired us to continue fighting for what we truly believe in. Mahaaaaaalo ! Aloha nō e Makaawaawa ē! Thank you for your beautiful and kind words. I am glad that I could help in some small way. I think that I am not always kind, but it is definitely something I’m working on:) Those someones somewhere make it tricky sometimes though:) And mahalo nui for taking the time to read it; I know so many of us are busy fighting our own fights and just trying to make it. Mahalo nui iā ʻoe! Ahahaha, yes! The kanaktion! It’s a beautiful thing to see. Especially when so many are seeing it at the same time! Mahalo nui to you for sharing your manaʻo! Your article was shared by my daughter. I read with interest on what you had to say and smiled. I smiled because your article says it explicitly on how important it is for us to know our past in order for us to face the future. It also made me smiled because my daughter’s mana is what her grandparents, her uncles, and the rest of our ohana have instilled in her. Your article was extraordinarily intuitive as to why we need to connect our past as a basis for how we will be facing the future. It is something that my parents taught me so very long ago. And it continues to show through the next generation of young adults that are in our family. Mahalo! Just to hear that you smiled from reading this piece is a huge compliment. Mahalo nui! Yes, it is so beautiful to see how mana instilled so long ago comes to fruition in the next generations. I am not that old (I think), but the youth of the leaders in this movement has been really inspiring and strengthening. Thank you so much for reading! Mahalo for your lovely reply. *Note: I am a beginner student, with much to learn – but even my clumsy language skills could pick that out; it was delightfully rich to come back and reread this. As I move into thinking more about Digital mediums, I will keep this close. Thank you so much for reading, and I’d love to hear more about your thoughts on digital mediums as you move more into it. Mahalo nui! Maika’i loa, mahalo for sharing such beautifully written insights and for urging us all to do our own research on the issue. The more informed we are, the better. These moments are such critical teaching and learning opportunities to reflect on who we want to be and the footprints that we each individually and collectively leave in this world. Holomua kākou! Mahalo nui iā ʻoe, e Shawn ē! Yes, I definitely think that we can always learn more for any issue. And hopefully we are open to what we find. Thank you so much for reading and for sharing your manaʻo! Thanks for this post, Bryan. Sharing this and the sources you provided with my honors critical theory course, as we discuss postcolonial theory, neocolonialism, – not as abstract literary theories, but as a way to understand real conflicts and resistance. Thank you. I am unapologetically pro-science and pro-technology. I am also a futurist as my blog postings show. However science, technology, and futurism should not and must not equate to the destruction of culture and tradition of any peoples. The current wave of protests against the construction of the next telescope on the summit of Mauna Kea, while news to me, is an ongoing clash between the culture and traditions of nativye peoples and the interests of outsiders. I have no opinions on the current protests, but this post is a good starting place to learn more. Mahalo nui, e cb! Yeah, as with so many things, there are a lot of nuances to this issue that are not coming across in a lot of the media coverage. The governor even still says stuff about how science and culture can co-exist on the mountain. For the vast majority of us, this movement isn’t anti-science as there are scientists on both sides of the issue and we are all proud of our community members who are in the sciences. In fact, a bunch of us are huge sci-fi and fantasy geeks as well. We’ve just been against the way that different sciences and members of the scientific community can and have steamrolled our interests for years. Anyway, thanks for the thoughtful frame for the reblog and for looking into the issue a bit more.